International Ambisonics works performed at ICSA in 3 concerts and transmitted on the radio in the long night of Ambisonics. Categories of Ambisonics music cover an open range from pure synthesis, abstract sound collages, imitation of real room instruments (e.g. church organs), spatial audio recordings of concerts, environmental soundfield recordings, experimental audio art work ... . 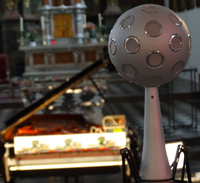 Selected contributions for the "PURE Ambisonics Concert" are dedicated composition for soundfields to be preproduced on computer, so that they can be performed by playback (with moderation) on the 3D Ambisonic loudspeaker system up to 5th order of the concert venue. 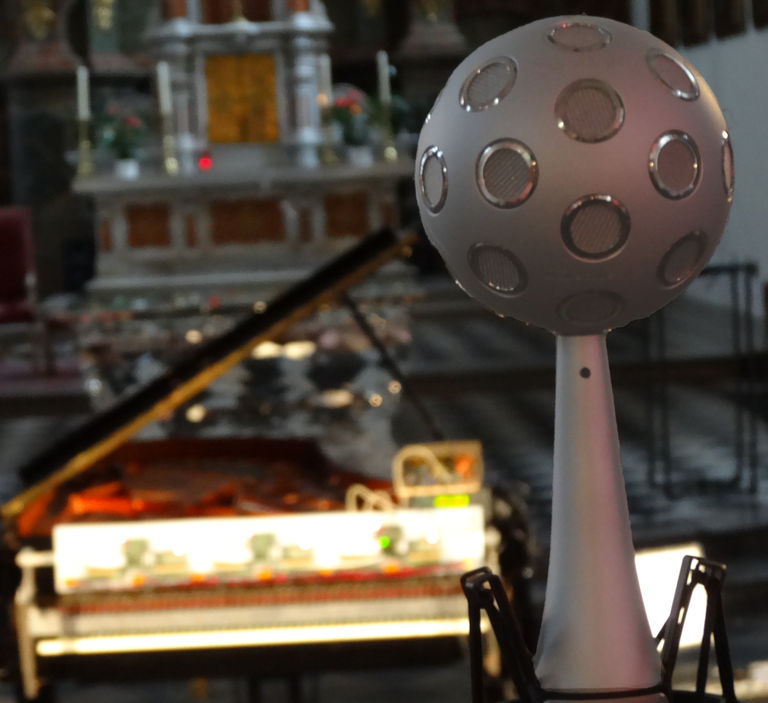 There is also plenty of time for additional pieces in the "Long Night of Ambisonics" after the concert, in which spatial audio recordings in Ambisonics of any order are one featured topic, along with recordings with virtual microphones within virtual 3D spaces. There is also a special interest in historical Ambisonics pieces, even if they might not fit the state-of-the-art quality. Interviews and live moderation will be held with the participants and audio contributers to be transmitted in the national radio Ö1. The moderation and a spatial audio material is mixed in the Ambisonics domain and will automatically be rendered for binaural and 5.1-downmixed radio broadcast(terrestrial/satellite). Historically you could interpret the Ambisonic music experience being in line with absolute music at the end of the 18th century and pure electro-acoustic works performed in the late 19th century. Like absolute music (or abstract music), Ambisonics pieces need not be explicitly "about" anything, and in contrast to program music, they may also be non-representational. Rather than playing with different loudspeaker characteristics and their spatial distribution, as e.g. in acousmatic music or loudspeaker theaters, the Ambisonic technology allows to feature and musically compose and shape the contents of the presented sound field as a "Virtual Auditory Environment" - AVE.
"Call for Ambisonics Music" is done in combination with the "International Conference on Spatial Audio", organized by Institute of Electronic Music and Acoustics (IEM) University of Music and Performing Arts and Technical University of Graz, Austria. In cooperation with Radio Österreich 1 and ORF musikprotokoll im steirischen herbst. ICSA called for Ambisonic music contributions to the ICSA concert night on September 18th 2015. Notification of acceptance will be issued on July 30th. Deadline for final submission of the entire piece is August 31st. Please monitor your contribution before submitting, using the binaural Ligeti Hall (MUMUTH) presets of the AmbiX Plugin Suite (http://matthiaskronlachner.com), to check its acoustical appearance. Concerts will take place in the Ligeti Concert Hall of MUMUTH and there will be a radio transmission in binaural (analog) and 5.1 (digital satellite radio). With the submission you will agree to be played at the concert and transmissions in connection with this concert. In addition, the broadcast mix can also be monitored at the conference in dedicated headphone/5.1 listening rooms. To produce the AmbiX format we recommend the AmbiX tools, where examples are provided as resources. If you use any other spatial audio format, we try to convert it to the proper AmbiX format, if you supply us with the needed information about the file format you submitted. If you have any question regarding the format or content, please contact us per email "music@icsa2015.iem.at". If you do not have access to or do not want to use a public or other file-sharing platform please contact us, so we can provide you your personal upload link: "music@icsa2015.iem.at"